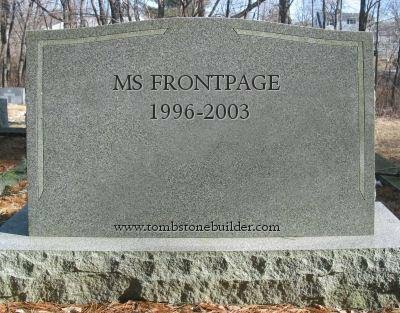 Any questions about using FrontPage are irrelevant. That application is severely outdated. The only thing you should be doing with it is deleting it from your system and getting current with one of the numerous modern editors available both free or paid. Thank you for your reply to my question. Please can you advise on which editor I could try that will not edit the page content when imported ? Depends what you mean by "import". Are you "importing" pages from a website? Is it your website? Why do the import? But... if there's a way for them to upload files then there must be a way for them to download files too. Are you saying that these people only have some sort of "upload website" tool and that's it? No way to see existing files? How do they upload and delete stuff? Right. The point I'm trying to make is that you shouldn't have to go through all this work to duplicate the website: if people can upload files then they should also be able to download files, and if they can download files then that's exactly what you want. I'll just give it another question or two. Do these people have FTP access to their website or are they truly limited to this builder thing? No FTP, just a design suite to upload images and alter text. Just going back to my original question... can I change a setting somewhere to stop Frontpage from altering the files hyperlinks with file:// and just save the file as is ? I don't know. You're asking questions about a piece of software released 16 years ago, and it wasn't even good at what it did.